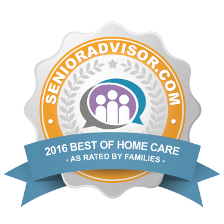 Care4You is proud to announce their selection as 2016 Best of In-Home Care Award from SeniorAdvisor.com, the largest ratings review site for senior care and services in North America. “Winners of this award represent the top tier of in-home care, assisted living, and other senior providers, based on the online reviews written by seniors and their families. This exclusive designation places the winners in the top 1% of senior care providers according to those who matter most — the consumers. The annual SeniorAdvisor.com best of awards celebrates the “Best of the Best” in Senior Living and In-Home Care across the United States and Canada. Of the nearly 100,000 providers currently listed on SeniorAdvisor.com, only a little over 1,000 are recognized with this award.